Part of what makes a CRM so useful for small business owners and managers are the reporting features. 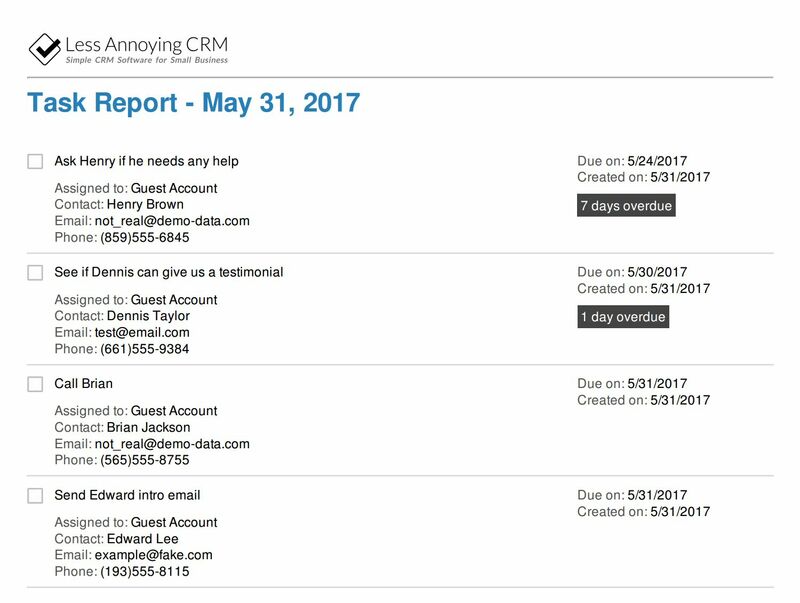 Less Annoying CRM users can pull reports in order to see all of their contacts, leads, upcoming tasks, past activities, and more! Pulling reports can help you get a snapshot of your CRM data as well as help you gain valuable insights into the future health of your business. If you still have questions after reading this article, please contact us! A CRM Coach can learn more about your business and recommend customizations and reports that can help you maximize your use of the CRM. Note: if you are not an admin on your account or you do not have access to certain exporting features, your settings might look a bit different than those described in this post. If you think you should have different permissions, talk to your account administrator. Sorting: When you sort a report, you are changing the order in which the items on the report are displayed. Filtering: When you filter a report, you are changing which items meet the report's criteria, or which items are displayed on the report. Using a combination of filtering and sorting, you can find exactly the records or items you're looking for AND you can make them display in the order that makes the most sense to you. Also, if you learn better with videos than you do written tutorials, check out a 30 minute webinar on reporting below! Want an invite to future webinars? Subscribe to our newsletter at the bottom of this post! The Find a Contact page (located in the main navigation bar) can show you all of the contacts and companies you have access to in your account (this could be just your records, or it could also include the records of other users on your account — it depends on how your permissions are set up). You can use this page to pull reports on contact and company data, including contact details (like name, address, and custom fields) as well as CRM activity (like the last time a contact was updated or when you added them to the CRM). You’ll want to use the sorting and filtering options at the top of the page. You can filter by record type, assigned user, any default and custom contact fields, as well as by group! And if you have exporting privileges, you can even export your contacts and companies to Excel to further manipulate your data. The Task Report (located under Your Workspace in the main navigation bar) can show you all the tasks scheduled in your CRM account (this could also include tasks assigned to other users — it depends on how your permissions are set up). You can use this page to keep track of all of your tasks and see what the rest of your team is working on. You can filter based on when the task is due, whether or not it is complete, and who the task is assigned to. You can use the sorting and filtering options at the top of the page. You can filter by due date, completion status, and assigned user! And if you have exporting privileges, you can even export your tasks to Excel to further manipulate your data. You can also print your task report if you prefer checking things off on paper. If a contact or company is attached to a task, their primary phone number and email will show up on the lefthand side of your task printed task report! The Activity Report (located under Your Workspace in the main navigation bar) can show you what was done in LACRM (entered notes, attended events, logged emails, completed tasks, and pipeline updates) over a specified date range. Depending on your permissions, you might be able to see other users’ activity, too. You can use this report to keep an eye on CRM activity and reference it in 1:1 meetings with sales reps. This can be particularly useful when onboarding your team, since you can see how much they’ve done in the CRM on a given day or week. You can filter the report based on activity type, user, and date range using the filtering options at the top of the report. You can filter by the activity type, the user who executed the activity, and the date range in which the activity took place! You can also print your activity reports if you want to send someone a PDF or hang onto a paper copy. Your pipeline reports (located in the main navigation bar) allow you to track a contact or company’s movement through a predetermined sequence of steps. You can customize your pipeline statuses and custom fields to pull more detailed pipeline reports. Folks have customized their pipelines to track leads, product orders, customer issues, new hires, and more! Want more videos like this? Check out our Youtube channel! You can use your pipeline reports to easily pull up a list of the contacts you are currently focusing on, whether those are leads, companies with open orders, or potential new hires. By using the field, status, group, and, if you have the right permissions, user filters at the top of the page, you can easily filter and sort your report to show you the exact records you are looking for. You can also use the number of rows displayed in the upper right hand corner of the report to make simple calculations. You can filter by status, assigned user, group, and any contact or pipeline fields! Plus, if you have exporting privileges, you can export your report to Excel to make more complicated calculations or summations, or you can print your report to share it with your employer or a vendor. After applying the relevant filters to generate the report you want, bookmark the webpage to get quick access to this exact report whenever you need to! Note: if you are running a report with date filters, you may need to edit that filter whenever you return to the report. You can do this by clicking the name of the field you need to edit in the yellow filtering bar at the top of the report. When you click on "Date Lead was created", a dialogue will appear. You can enter a new date range or delete the date filter altogether from this dialogue. Contact us! Less Annoying CRM has free and unlimited support. We’d be happy to show you around the CRM, help you set up your customizations, and give you step by step instructions for the report you want to pull.